Indicate by check mark whether the registrant is a large accelerated filer, an accelerated filer, a non-accelerated filer, a small reporting company or an emerging growth company. See the definitions of “large accelerated filer”, “accelerated filer”, “smaller reporting company” and “emerging growth company” in Rule 12b-2 of the Exchange Act. Our unaudited interim financial statements for the six month period ended June 30, 2018 form part of this quarterly report. They are stated in United States Dollars (US$) and are prepared in accordance with generally accepted accounting principles in the United States. Zhen Ding Resources Inc. (formerly Robotech Inc.) (the “Company”, “Zhen Ding DE”, or “ZDRI”) was incorporated in the State of Delaware in September 1996 and began its business activities in the development and marketing of specialized technological equipment. In early 2010, the business direction of our Company was changed to seek opportunities to focus particularly on searching for companies engaged in the mining of gold, silver and copper. The Company indirectly owns 70% of a Chinese Joint Venture entity, Zhen Ding Mining Co. Ltd. (“Zhen Ding JV” or “JXZD”). This indirect ownership is through a 100% ownership of a California company Z&W, Zhen Ding Corporation (“Z&W CA”). Our Company, through Z&W CA, participates in a joint venture with Jing Xian Xinzhou Gold Co., Ltd. (“Xinzhou Gold”), a company organized under the laws of the People’s Republic of China (“PRC”). The joint venture company, JXZD, is 70% held by our Company through Z&W CA who has the mineral exploration, mineral mining and gold mining rights to a property located in the southwestern part of Anhui province in China, near the town of Jing Xian. Xinzhou Gold, the other 30% partner of JXZD is the actual named owner of the various licenses used by JXZD and transferred all rights emanating from these licenses as part of the joint venture agreement between Z&W CA and Xinzhou Gold. Our Company’s primary activity, through JXZD, is ore processing and production in China. In 2017, the Company shut down its mineral processing plant in China due to insufficient working capital. The Company had limited operations and plans to resume selling processed ore concentrate as soon as possible to provide Zhen Ding JV the cash flow needed to keep its plant operating and to maintain a viable work force for future expansion. The summary of significant accounting policies presented below is designed to assist in understanding the Company’s financial statements. Such financial statements and accompanying notes are the representations of the Company’s management, which is responsible for the integrity and objectivity. These accounting policies conform to accounting principles generally accepted in the United States of America (“U.S. GAAP”) in all material respects and have been consistently applied in preparing the accompanying financial statements. The accompanying unaudited consolidated financial statements and related notes have been prepared in accordance with accounting principles generally accepted in the United States of America (“U.S. GAAP”) for interim unaudited consolidated financial information. Accordingly, they do not include all of the information and footnotes required by U.S. GAAP for complete consolidated financial statements. The unaudited consolidated financial statements furnished reflect all adjustments (consisting of normal recurring adjustments) which are, in the opinion of management, necessary for a fair presentation of the results for the interim periods presented. Interim results are not necessarily indicative of the results for the full year. These unaudited consolidated financial statements should be read in conjunction with the audited consolidated financial statements of the Company for the year ended December 31, 2017 and notes thereto contained in the Company’s Annual Report on Form 10-K. The consolidated financial statements include the accounts of the Company, its wholly-owned subsidiaries Z&W CA and its majority owned subsidiary JXZD. All inter-company transactions and balances were eliminated. The portion of the income applicable to non-controlling interests in subsidiary undertakings is reflected in the consolidated statements of operations. The Company prepares its financial statements in conformity with U.S. GAAP, which requires management to make estimates and assumptions that affect the reported amounts of assets and liabilities and disclosure of contingent assets and liabilities at the date of the financial statements and the reported amounts of revenues and expenses during the reporting period. Actual results could differ from those estimates. Assets and liabilities recorded in foreign currencies are translated at the exchange rate on the balance sheet date. Revenue and expenses are translated at average rates of exchange prevailing during the year. Any translation adjustments are reflected as a separate component of stockholders’ equity (deficit) and have no effect on current earnings. Gains and losses resulting from foreign currency transactions are included in current results of operations. During the six months ended June 30, 2018 and 2017, the Company had aggregate foreign currency translation gain (loss) of $142,022 and $(173,834), respectively. The Company considers all highly liquid investments purchased with an original maturity of six months or less to be cash equivalents. Management reviews long-lived assets for impairment whenever events or changes in circumstances indicate that the carrying amount may not be realizable or at a minimum annually during the fourth quarter of the year. If an evaluation is required, the estimated future undiscounted cash flows associated with the asset are compared to the asset’s carrying value to determine if an impairment of such asset is necessary. The effect of any impairment would be to expense the difference between the fair value of such asset and its carrying value. In 2015, the Company idled its mineral processing plant and wrote the assets down to their estimated fair value of $0 based on expected future cash flow using Level 3 inputs under ASC 820. The Company is currently seeking investment to restart the operations. An asset and liability approach is used for financial accounting and reporting for income taxes. Deferred income taxes arise from temporary differences between income tax and financial reporting and principally relate to recognition of revenue and expenses in different periods for financial and tax accounting purposes and are measured using currently enacted tax rates and laws. In addition, a deferred tax asset can be generated by net operating loss carry forwards. If it is more likely than not that some portion or all of a deferred tax asset will not be realized, a valuation allowance is recognized. The Company has tax losses that may be applied against future taxable income. The potential tax benefit arising from these loss carryforwards are offset by a valuation allowance due to uncertainty of profitable operations in the future. Management believes that the carrying amounts of the Company’s financial instruments, consisting primarily of cash, accounts receivable and accounts payable, approximated their fair values as of June 30, 2018 and December 31, 2017, due to their short-term nature. Non-controlling interests in the Company’s subsidiaries are reported as a component of equity, separate from the parent’s equity. Purchase or sale of equity interests that do not result in a change of control are accounted for as equity transactions. Results of operations attributable to the minority interest are included in our consolidated results of operations and, upon loss of control, the interest sold, as well as interest retained, if any, will be reported at fair value with any gain or loss recognized in earnings. The basic net loss per common share is computed by dividing the net loss by the weighted average number of common shares outstanding. Diluted net loss per common share is computed by dividing the net loss adjusted on an “as converted” basis, by the weighted average number of common shares outstanding plus potential dilutive securities. For all periods presented, there were no potentially dilutive securities outstanding. The Company evaluated events subsequent to June 30, 2018 through the date the financial statements were issued for disclosure consideration. There were various accounting standards and interpretations issued recently, none of which are expected to have a material impact on our financial position, operations or cash flows. These consolidated financial statements have been prepared on a going concern basis, which implies the Company will continue to meet its obligations and continue its operations for the next twelve months. As of June 30, 2018, the Company had accumulated losses of $19,249,872 since inception and had a working capital deficit of $8,847,204. These factors raise substantial doubt regarding the Company’s ability to continue as a going concern. The continuation of the Company as a going concern is dependent upon financial support from its stockholders, the ability of the Company to obtain necessary debt or equity financing to continue operations, and the attainment of profitable operations. Realization value may be substantially different from carrying values as shown and these financial statements do not include any adjustments to the recoverability and classification of recorded asset amounts and classification of liabilities that might be necessary should the Company be unable to continue as a going concern. During the six months ended June 30, 2018, the Company recorded interest expense and accrued interest of $1,488. As of June 30, 2018 and December 31, 2017, the Company had payables of $808,181 and $799,282, respectively, to Xinzhou Gold. These payables bear no interest, are unsecured and are due on demand. As of June 30, 2018 and December 31, 2017, the Company had short-term debts to related parties of $3,872,797 and $3,939,377, respectively. The details of the loans are described as below. As of June 30, 2018 and December 31, 2017, the Company had accrued interest payable to the related parties of $3,706,637 and $3,479,101, respectively. For the periods ended June 30, 2018 and 2017, the Company recorded interest expense of $291,587 and $270,621, respectively. The Company has received no demands for repayment of matured debt instruments. As of June 30, 2018 and December 31, 2017, the Company had deferred revenue of $136,931 and $154,619 related to receipts of payment for unprocessed ore from Xinzhou Gold Co. Ltd, respectively, related to advances that the Company received from its customers. The Company has received no demands for repayment of deferred revenues. Substantially all of the Company’s bank accounts are in banks located in The People’s Republic of China and are not covered by protection similar to that provided by the FDIC on funds held in United States banks. The Company’s operations in China may be adversely affected by significant political, economic and social uncertainties in the PRC. Although the PRC government has been pursuing economic reform policies for more than twenty years, no assurance can be given that the PRC government will continue to pursue such policies or that such policies may not be significantly altered, especially in the event of a change in leadership, social or political disruption or unforeseen circumstances affecting the PRC’s political, economic and social conditions. There is also no guarantee that the PRC government’s pursuit of economic reforms will be consistent or effective in the future. This quarterly report contains forward-looking statements. These statements relate to future events or our future financial performance. In some cases, you can identify forward-looking statements by terminology such as “may”, “should”, “expects”, “plans”, “anticipates”, “believes”, “estimates”, “predicts”, “potential” or “continue” or the negative of these terms or other comparable terminology. These statements are only predictions and involve known and unknown risks, uncertainties and other factors that may cause our or our industry’s actual results, levels of activity, performance or achievements to be materially different from any future results, levels of activity, performance or achievements expressed or implied by these forward-looking statements. Although we believe that the expectations reflected in the forward-looking statements are reasonable, we cannot guarantee future results, levels of activity, performance or achievements. Except as required by applicable law, including the securities laws of the United States, we do not intend to update any of the forward-looking statements to conform these statements to actual results. In this quarterly report, unless otherwise specified, all dollar amounts are expressed in United States dollars and all references to “common shares” refer to the common shares in our capital stock. As used in this quarterly report, the terms “we”, “us”, “our” and “our company” mean Zhen Ding Resources Inc., unless otherwise indicated. We are engaged in seeking business partnership opportunities with companies that are in the field of exploration and extraction of precious and/or base metals, primarily in China, which are in need of funding and improved management. We would provide the necessary management expertise and assist in financing efforts of these mining operations. In exchange, we would acquire metal ores produced by these mines and process the ores in our ore milling plant and sell the ore concentrates to metal refineries. Our only operating company is Zhen Ding JV, which engages in the processing of metal ore and the selling of ore concentrates of gold, silver, lead, zinc and copper at purity levels ranging from 65% to 80%. Zhen Ding JV purchases metal ore in rock form from its joint venture partner, Xinzhou Gold, which has rights to explore and mine ore from a property located in the southwestern part of Anhui province in China. Our principal office is located at 353 St. Nicolas, Suite 205, Montreal, Quebec H2Y 2P1. Our operational offices are located at: Zhen Ding Mining Co. Ltd., Wuxi County, Town of Langqiao, Jing Xian, Anhui Province, China, Tel: 86-6270-9018. We were incorporated in September 1996 as Robotech Inc., and began our business in the development and marketing of specialized technological equipment. At that time we estimated that we would require approximately $6,000,000 to realize our plans. Through the year of 2003, we had not reached our financing goals and therefore abandoned that particular business plan. Since that time, we have been seeking suitable candidates for acquisition. From the early 2000s until approximately 2013, there was an overall worldwide recovery in the price and markets for precious metals, minerals and industrial commodities. Such interest was fueled to a large degree, by the economic awakening of the two most populous nations, China and India and further bolstered by a sharp decline in the US dollar. These circumstances resulted in significant increases in the market prices of gold, silver and copper. Thus, in early 2010, the business direction of our company was changed to seek to profit from this commodities revival, and we began to focus our acquisition search in that industry, particularly on companies engaged in the mining of gold, silver and copper. 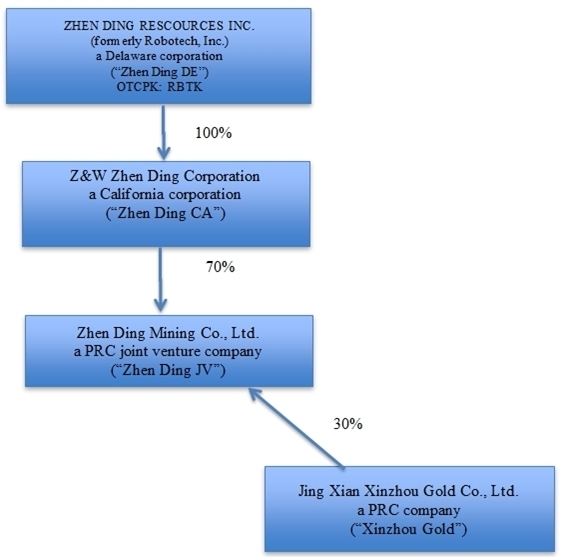 In January 2012, our board of directors, with authorization from the majority of the shareholders of our company, made an offer to the shareholders of Zhen Ding Resources Inc., a Nevada corporation (“Zhen Ding NV”), to acquire, at the very least, the majority of their common shares, and, if available, up to 100% ownership. Zhen Ding NV through its wholly owned subsidiary, Z&W Zhen Ding Corporation, a California corporation (“Zhen Ding CA”), has been engaged in a joint venture with Jing Xian Xinzhou Gold Co., Ltd. (“Xinzhou Gold”), a company organized under the laws of the People’s Republic of China (“PRC”). The joint venture company, Zhen Ding Mining Co. Ltd. (“Zhen Ding JV”) is 70% held by Zhen Ding NV through Zhen Ding CA. It is a common practice in China to append the name of the town or city where an enterprise is located to its legally incorporated name. Thus many documents referencing Zhen Ding JV may refer to it as Jing Xian Zhen Ding Mining Co. Ltd. Zhen Ding JV engages in the processing of metal ore and the selling of ore concentrates of gold, silver, lead, zinc and copper at purity levels ranging from 65% to 80%. Zhen Ding JV purchases metal ore in rock form from Xinzhou Gold. On March 8, 2012, we changed our name from Robotech, Inc. to Zhen Ding Resources Inc., in anticipation of the acquisition of Zhen Ding NV. Our trading symbol, RBTK, however remained unchanged. During 2012, a total of 50,746,358 shares of the issued and outstanding common stock of Zhen Ding NV were tendered to our company. On August 13, 2013, an additional 13,100,000 shares were tendered to us. Thus, as of August 13, 2013 the shareholders of Zhen Ding NV had tendered 100% of the issued and outstanding shares of common stock, representing 100% of the issued and outstanding equity of Zhen Ding NV to us. On October 23, 2013, we issued 122,440 shares of our common stock, on a one-for-one basis, to the tendering shareholders of Zhen Ding NV making Zhen Ding NV a wholly owned subsidiary of our company. On October 28, 2013, we dissolved Zhen Ding NV by merging it with and into Zhen Ding DE. As a result, Zhen Ding CA became a wholly-owned subsidiary of Zhen Ding DE. Zhen Ding CA continues to exist as an intermediate holding company with no operations of its own, but which in turn owns our 70% interest in Zhen Ding JV. Presently, we are conducting our operations exclusively through Zhen Ding JV, our joint venture company. However, we continue to look for other attractive potential acquisition targets in the mining industry. Our joint venture, Zhen Ding JV, is equipped to process ore mined by our joint venture partner Xinzhou Gold when in operation. Zhen Ding JV purchases the ore in rock form from Xinzhou Gold and processes the ore into our final product, which is a gold, silver, lead, zinc and copper ore concentrate. We estimate that our processed product is 65% to 80% pure. The product is then sold to refineries which further purify and separate the concentrate. Zhen Ding JV also arranges all exploration, mining process and operations, and financial and administrative support for Xinzhou Gold’s mine, known as the Wuxi Gold Mine. We purchase all of our raw material from Xinzhou Gold for our ore processing operation and rely solely on Xinzhou Gold for our supply of ores. The veins most recently excavated by Xinzhou Gold in the permitted areas of our mines are very low grade and, as such, the production is minimal. The higher yielding and therefore more profitable veins run outside Xinzhou Gold’s permitted mining area boundaries under its current license. Xinzhou Gold applied for an extension of the permitted mining area, however, the application was rejected by the government in December 2016 due to Xinzhou Gold’s insufficient working capital. Xinzhou Gold intends to reapply for an extension of the permitted mining area when it is able to demonstrate sufficient working capital to drill the extended area. However, if sufficient working capital is unavailable, or should the application be denied on other grounds, we would not be able to secure another source with higher grade ores for our processing plant, which would severely limit our ability to execute our plan of operation and our potential profitability. At the beginning of fiscal 2015, we idled our mineral processing plant due to an overall downturn in the demand and market prices for our concentrates. This downturn has coincided with an overall economic recession in China and downturn in the global commodities market over the past 12 months. During the six months ended June 30, 2018, we actively sought an investment of approximately $3,000,000, which we believe is required to expand Xinzhou Gold’s mining permit, and which would allow us to resume our ore extraction and refinery activities. However, as at the date of this report we have not successfully secured any financing commitment. Due to our continued inability to raise sufficient financing to expand Xinzhou Gold’s mining permit, Xinzhou Gold elected to reapply for a new drilling permit based on a scaled-down drilling plan. The resulting new permit application, which was submitted to the Anhui Province Land & Resources Bureau for approval on March 8, 2017, seeks renewed permission to continue drilling in the areas directly adjacent to our concentration plant. We intend to resume selling processed ore concentrate as soon as possible in order to supply Zhen Ding JV with the cash flow needed to keep its plant running and to maintain a viable work force for future expansion. However, we are not able to predict at this time when economic conditions will allow us to resume our ore refinery operation. In anticipation of financing and permit approval, our joint venture engaged contractors during the six months ended June 30, 2018 to conduct safety inspections and repairs, and to plan anticipated drilling locations. We also engaged Mr. Dai Honglin as Chief Engineer and general manager of Xinzhou Gold’s and our gold mining operations. Mr. Dai brings over thirty years’ experience to our company in the evaluation, development and exploration of gold, copper, zinc, and lithium projects throughout China and South Africa. He completed training in mineral exploration at the Heilongjiang Institute of Mines in 1983. Mr. Dai also currently holds the position of the chairman of Beijing Hongbang Pile Geotechnical Engineering Co., Ltd. Going forward, we will continue to seek sufficient financing to re-establish our mineral extraction and refining operations. We will also seek to identify and evaluation businesses opportunities and other strategic transactions on an ongoing basis with a view toward diversifying our business and optimizing shareholder value. We had not earned any revenues in the three months ended June 30, 2018 and 2017. Our lack of revenue was due to our inability to find better quality materials for our production. We had a net loss of $147,833 for the three months ended June 30, 2018, representing a nominal 14.40% decrease from our net loss of $172,711 for the three months ended June 30, 2017. The change in our results over the two periods is a result of a decrease in our general and administrative expense and an increase in other income from receipt of deposit that was written-off in prior year. We had not earned any revenues during the six months ended June 30, 2018 and 2017. Our lack of revenue was due to our inability to find better quality materials for our production. We had a net loss of $310,271 for the six months ended June 30, 2018, representing a 13.93% decrease from our net loss of $360,502 for the six months ended June 30, 2017. The change in our results over the two periods is a result of a decrease in our general and administrative expense and an increase in other income from receipt of deposit that was written-off in prior year. As of June 30, 2018, we had current assets of $18,602 consisting of cash and cash equivalents and other current assets, current liabilities of $8,865,806 and a working capital deficit of $8,847,204. This compares to our current assets of $7,669 consisting entirely of cash, current liabilities of $8,686,166, and working capital deficit of $8,678,497 as of December 31, 2017. The increase in cash and in liabilities during the most recent period resulted primarily from receipt of third party loans and the accumulation of interest expense on related party loans. As of June 30, 2018, we had accumulated and other comprehensive losses of $19,249,872 since inception. We anticipate generating additional losses and, therefore, may be unable to continue operations further in the future. Net cash used in operating activities during the six months ended June 30, 2018 was $57,170, a 24.75% decrease from the $75,974 in net cash outflow during the six months ended June 30, 2017. The decrease was a result of a marginal decrease in our business activities and administrative cost saving measures during the most recent period. During the six months ended June30, 2018 and 2017, we had no sales and did not purchase any raw materials. Cash provided by financing activities during the six months ended June 30, 2018 was $66,064, which was a 19.95% decrease from the $82,533 cash provided by financing activities during the six months ended June 30, 2017. The increase was a result of fewer related party loans during the most recent period. • Continue to pursue potential financing activities. • The funds raised would be used to (a) identify additional veins, (b) to re-start the mill, (c) re-test the mill, (d) develop expansion plans for our plant capacity, (e) drilling additional holes near the concentration plant and (f) undertake at least three deep drill holes in the permit area. • To re-commence greater milling operations as soon as possible. This will involve re-hiring all personnel laid off as a result of the mining halt. • Actively seek partnerships with mining enterprises primarily active in the gold, silver and/or copper fields and subject to the general parameters described earlier to increase our supply of raw material. The extent of this program is dependent on the success of the $3,000,000 financing efforts currently underway, as described earlier. To date we have relied on proceeds from the sale of our shares and on loans from our directors and officers in order to sustain our basic minimum operating expenses; however, we cannot guarantee that we will secure any further sales of our shares or that our related parties with provide us with any future loans. We estimate that the cost of maintaining our current operations and reporting requirements will be approximately $20,000 per month. Due to our cash position of $16,614 as of June 30, 2018, we estimate that we will require approximately $223,000 to sustain our current operations for the next twelve months, or approximately $3,000,000 to execute our above described exploration plan. We are not aware of any known trends, demands, commitments, events or uncertainties that will result in or that are reasonably likely to result in our liquidity increasing or decreasing in any material way. We anticipate continuing to rely on equity sales of our common stock in order to continue to fund our business operations. Issuances of additional shares will result in dilution to our existing stockholders. There is no assurance that we will achieve any additional sales of our equity securities or arrange for debt or other financing to fund our planned business activities. We presently do not have any arrangements for additional financing for the expansion of our exploration operations, and no potential lines of credit or sources of financing are currently available for the purpose of proceeding with our plan of operations. We have no off-balance sheet arrangements that have or are reasonably likely to have a current or future effect on our financial condition, changes in financial condition, revenues or expenses, results of operations, liquidity, and capital expenditures or capital resources that are material to stockholders. We maintain disclosure controls and procedures that are designed to ensure that information required to be disclosed in our reports filed under the Securities Exchange Act of 1934, as amended, is recorded, processed, summarized and reported within the time periods specified in the Securities and Exchange Commission’s rules and forms, and that such information is accumulated and communicated to our management, including our president (our principal executive officer) and our chief financial officer (our principal financial officer and principal accounting officer) to allow for timely decisions regarding required disclosure. As of the end of the quarter covered by this report, we carried out an evaluation, under the supervision and with the participation of our president (our principal executive officer) and our chief financial officer (our principal financial officer and principal accounting officer), of the effectiveness of the design and operation of our disclosure controls and procedures. Based on the foregoing, our management concluded that our internal controls are not effective. due to material weaknesses in our control environment and financial reporting process, lack of a functioning audit committee, a majority of independent members and a majority of outside directors on our Board of Directors, resulting in ineffective oversight in the establishment, and lack of monitoring of required internal control and procedures. We know of no material, existing or pending legal proceedings against our company, nor are we involved as a plaintiff in any material proceeding or pending litigation. There are no proceedings in which any of our directors, executive officers or affiliates, or any registered or beneficial stockholder, is an adverse party or has a material interest adverse to our interest. The Company was previously subject to a cease trade order (the “CTO”) issued by the L’Autorité des Marchés Financiers (Financial Markets Authority) of Quebec ("AMF") on September 29, 2014 (copy enclosed) with respect to failure to file the following public disclosure documents in Canada: (i) unaudited interim financial statements, interim management's discussion and analysis and certification of interim filings for the periods ended September 30, 2012, March 31, 2013, June 30, 2013, September 30, 2013, March 31, 2014, and June 30, 2014; (ii) audited annual financial statements, annual management's discussion and analysis, annual information form, certification of annual filings for the year ended December 31, 2013; and (iii) its annual information form for the year ended December 31, 2012, the whole as required pursuant to Canadian Multilateral Instrument 51-105. On August 7, 2018 the AMF granted a full revocation of the CTO issued against the Company. In light of the revocation, the Company and its insider may issue, trade and otherwise transact securities of the Company.